Taking quality as our primary concern, we are engaged in offering PP Chemical Bag. 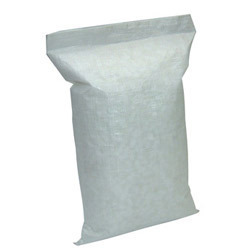 Used for packing various chemicals, the offered bags are developed in adherence to the guidelines laid in the industry. Apart from this, the offered bags are available for our customers at industry leading prices. Since our establishment in the year 1984, we, Narmada Extrusions Ltd., are reckoned in the industry as one of leading manufacturers and suppliers, engaged in offering our clients PP Woven Bags, HDPE Woven Sack Bag, PP Woven Sack Bag, PP Woven fabric, HDPE Fabric, PP Jumbo Bag, PP Sugar Bag, etc. These bags are widely demanded in the market for their features like lightweight, high tearing strength, perfect finish, moisture resistance and durability. Owing to the above mentioned features, the offered range is demanded across various industries. Our offered range is manufactured using quality-assured raw materials that are obtained from accredited vendor of the industry.